Do you ever have those days when you just don’t feel like doing anything? Today is one of those days for me. I am totally pooped from participating in Beer Olympics last night. The hubby had his friends over for some Olympic watching fun, and I “participated,” drinking all of two beers (gross) and staying up until 2 a.m. Thankfully, we cleaned the house yesterday and tidying up today was easy. AND, I brought my MAC home! So, I am crafting on my computer today and taking it easy. Tomorrow it will be back to work. Brian and I are going to take down part of our old fence and I plan on spraying the back yard one last time for poison ivy. I have the smallest patch of poison ivy on my foot and I’m not sure whether I got it from our yard or the river walk last weekend. Better to be safe than sorry, right? I also want to start staining the coffee table my dad gave me last weekend. I think it’s going to look really nice once it’s a little darker, so hopefully my energy and motivation will return tomorrow full force. Today I made a new graphic design print. I think I might want to do a gallery-style wall in our living room of several of the prints I’ve designed. Would it be tacky to have nice quotes and sayings on our living room walls? I can’t decided. Either way, here’s the print I designed today. 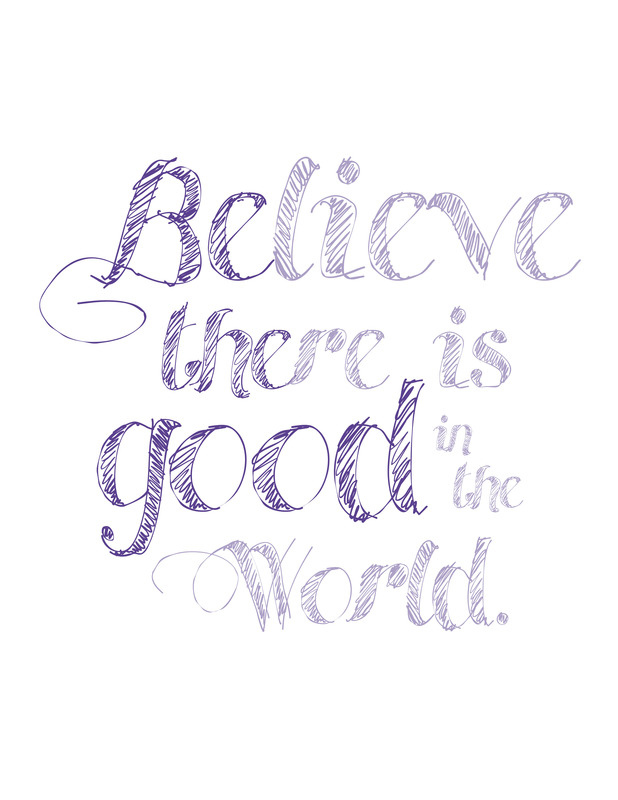 This one is fun, combining two nice thoughts in one using different shades of purple: “Believe there is good in the world” and “Be the good in the world.” I won’t claim to have thought of that myself, but I also couldn’t tell you where I saw it done originally. I used a new font I recently downloaded called Made with B.
I also changed the colors around so the hidden saying pops more. Which do you like better? I think I prefer version two to version one. Well, time to go to a neighbor’s going away bash at my Dad’s house. 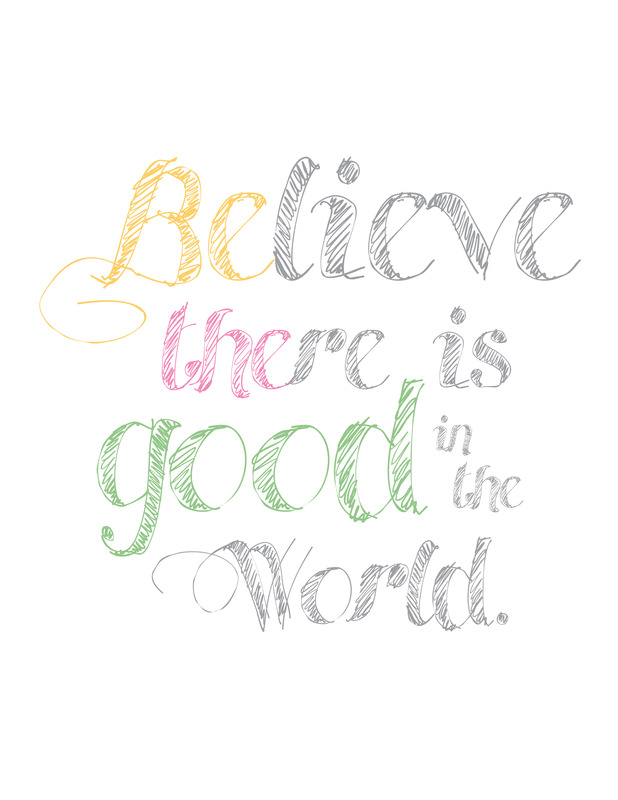 Enjoy your Saturday and your weekend! Love it! I was going to make my friend a wooden sign & was looking for the right font. I’m going to use this! Will post when I’m done. Thanks!